"Simple sauce that combines sweet, sour, salty, and spicy flavors into a wonderful dipping sauce for chips, grilled chicken, and spring rolls. It can be kept in the fridge for about a week." Stir the vinegar and sugar together in a small saucepan over medium heat until the sugar dissolves completely, 7 to 10 minutes; add the salt, reduce heat to low, and simmer until the mixture thickens slightly, about 5 minutes. 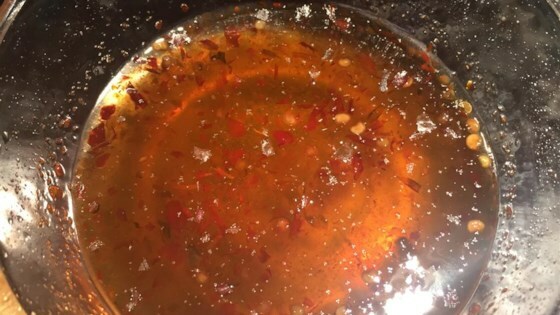 Remove from heat and stir the chili garlic sauce into the mixture. Allow to cool slightly before serving. I love this sauce with cold spring rolls, this and the spicy peanut sauce are the main reasons we make the spring rolls! Love it and you can use white or rice vinegar. Delish! Sauce has a great flavor, but didn't thicken when I made it. Very tasty; especially yummy with my egg rolls. I will definately make this sauce again. This was amazing. Made it to eat with Crab Rangoon on NYE! It did not disappoint!!! Very similar to our restaurant here that we like! Super simple and delicious. It really zazzed up my frozen spring rolls for dinner!